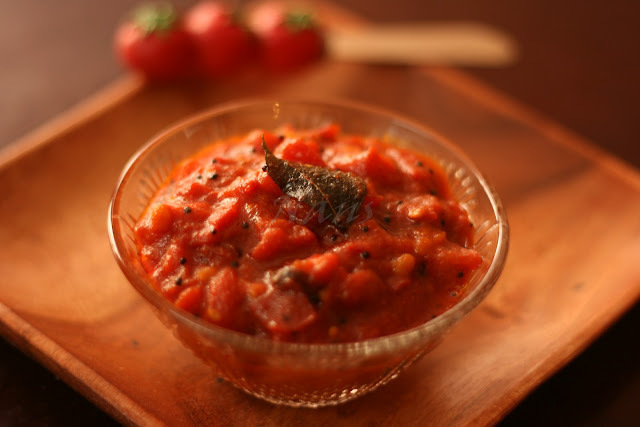 Every time we visited Chennai, a bottle of Tomato Thokku from Grand Sweets was a must buy! 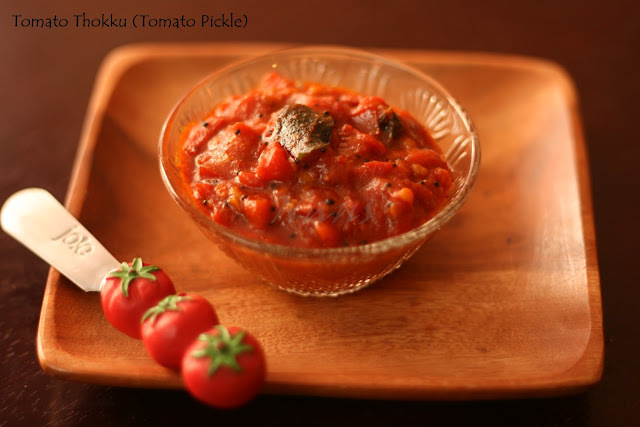 We just loved the delicious taste of this south Indian pickle specially the one available in Chennai. 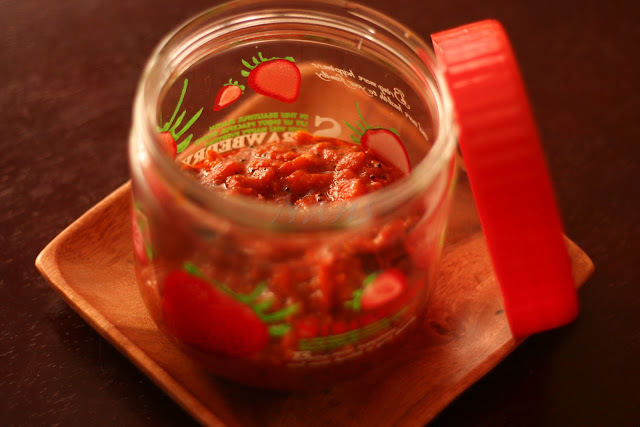 Be it with rice, Idlies, Dosas or Chapatis, this accompaniment goes well with it all. The only problem with this bought out pickle was the oil content. It was a bit too oily and due to this, our frequency of purchase reduced but the craving did not stop! 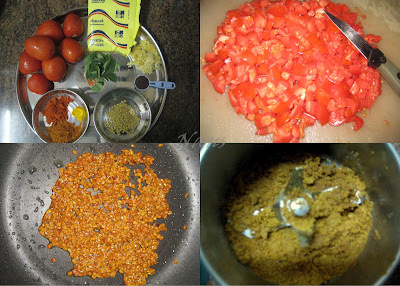 Finely chop the tomatoes into small pieces. Roast the fenugreek seeds in a little oil until golden brown, remove from stove and allow to cool. Once cooled, grind into a fine powder. 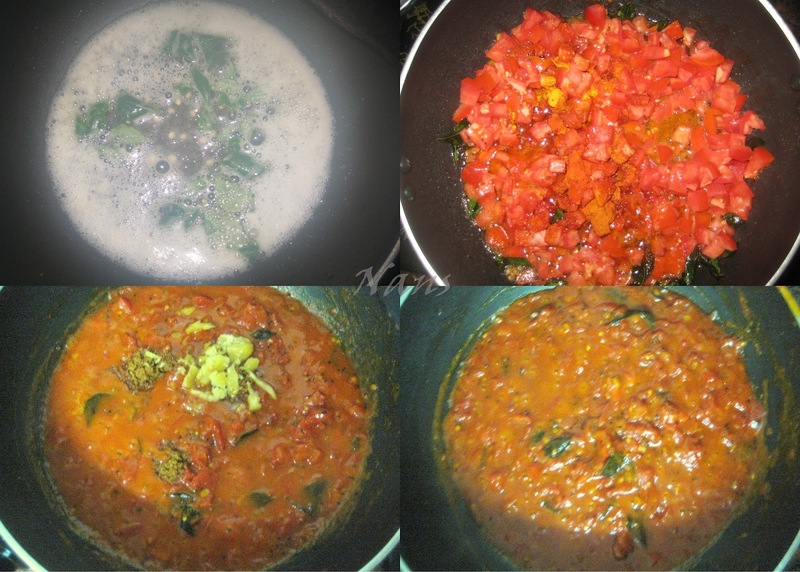 Heat oil in a pan and add urid dal. Once it turns light brown, add mustard, curry leaves and asafoetida. 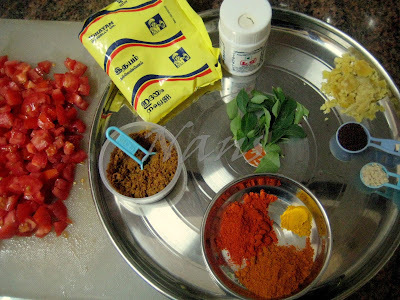 Add the chopped tomatoes, red chilli powder, turmeric powder, sambar powder and salt. Mix well and let it cook for 7-8 minutes on medium flame. Now add the jaggery and ground fenugreek seed powder. Mix well and allow to cook for another 2 minutes. Oil will start to separate out of the mix. Turn off the stove and allow the preparation to cool. Store in an air tight container and refrigerate. Use only a dry spoon while serving. The pickle can be stored up to 10-12 days. Hi First time to your space and I love the recipes and pictures.Excellent photo loved your poems on that baby womb(women's Era) so good... happy to see a talented women like you friends???? ?